So you want to be an engineer and make money, but unsure of where to start? Check out the top engineering schools with the highest-paid graduates. 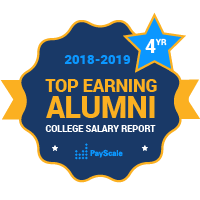 Engineering schools almost always win top marks in PayScale’s College Salary Report because their graduates leave school with a specific, applicable set of in-demand skills that employers are willing to pay top dollar for. Some of the most famous engineering schools in the United States are the Massachusetts Institute of Technology (MIT), the United States Naval Academy, the Georgia Institute of Technology and Carnegie-Mellon University. Harvey Mudd College in Claremont, California, is almost always on this list, as is the United States Naval Academy at Annapolis. Both of these rankings are based on bachelor’s only alumni. When we include alumni who go on to earn graduate degrees, the Massachusetts Institute of Technology also does well. Many MIT grads go on to earn master’s degrees, MBAs and PhDs, and by doing so they increase their median salary. Engineering schools are defined as any school (public or private) that grants more than 50 percent of their undergraduate degrees in math, sciences, computer science, and engineering and engineering technology majors. These degrees tend to lead to very high-paying jobs, even right after college.